The long-term safety of screening embryos for genetic diseases is going unchecked, experts warn. Preimplantation genetic diagnosis (PGD) is a way of checking an embryo is free of inherited diseases before it is put into the womb to grow. 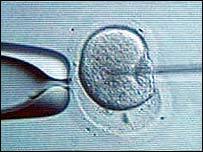 However, PGD is relatively new and involves removing a cell from an embryo when it is around three-days old. Experts say not all babies born after PGD are being followed up to check for any adverse effects this might have. PGD was first introduced in 1990 as an experimental procedure. Since then, it is estimated that more than 1,000 babies have been born following PGD. In November 2001, the Human Fertilisation and Embryology Authority (HFEA) agreed on conditions in which PGD could be used under the Human Fertilisation and Embryology Act (1990) and in line with the results of a public consultation on the acceptability of PGD. It has granted licences for PGD to screen for the genetic form of cystic fibrosis and Huntington's disease. It has also said PGD can be used to check for an inherited form of bowel cancer called familial adenomatous polyposis and so that embryos can be selected purely because they are a tissue match for a sick sibling. There are eight centres in the UK that currently offer PGD to couples from families with a strong history of inherited diseases. In the UK alone, about 100 cycles of PGD are carried out each year and worldwide there are about 1,000, according to the HFEA. Professor Peter Braude, professor of Obstetrics and Gynaecology at Kings College London, one of the UK centres offering PGD, questioned why all PGD centres were not all following up PGD babies. "We follow up all of our babies at two month, six months, one year, two years and five years and that's very important." He said some families would not want to be contacted again after the procedure. For example, some parents might not want the child or the rest of their family to know that they had undergone PGD. "But every single baby whose parents are willing to have their babies followed up ought to be followed up." He said there was a move for a European PGD register. PGD expert Dr Siobhan SenGupta, from University College London, said the technique "appears to be safe so far". "The children born to PGD have not shown any greater abnormalities than children born naturally. "But only time will tell." Recently, the Reproductive Institute of Chicago study looked at 754 babies born after in-vitro fertilisation pregnancies where PGD was used. It found they were no more likely to suffer birth defects than babies born after natural pregnancies. A spokesman from the HFEA said: "We certainly recognise the importance of following up children who have been screened with PGD." But he said it was not currently a legal requirement or standard practice. He said another weakness at the moment was confidentiality rules that made it impossible for the HFEA to share its data on PGD children with the relevant interested parties and specialists. "That might change when there is a review of the Human Fertilisation and Embryology Act later this year," he said.